Ever since Tiger Woods stormed onto the scene blasting the ball down the fairways, there has been a strong push for golfers to integrate strength training into their "bag" of fitness and conditioning regimens. From my perspective as a performance-enhancement specialist, it is wonderful to see athletes improving their performance through strength-training programs. However, strength training for golfers is only effective if it produces the desired results on the course. 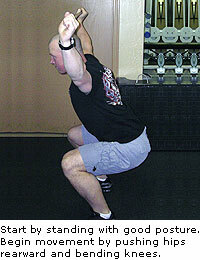 There are several key areas of the body in which increasing strength will help improve performance on the golf course. One of these areas is a set of muscles known as the posterior chain. 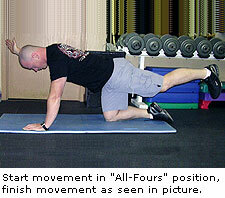 In this article, I will describe how to strengthen this group of muscles. Exercise Protocol: Two or three sets of 10 to15 repetitions each of any two of the exercises two to three times per week. Increase your resistance only after you have perfected each movement. Always stand with good posture. Always slightly retract and depress your shoulders (press them down and back.) 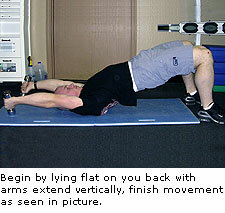 Maintain this position throughout the movement. Practice the "Drawing-In Maneuver." This is a function of the inner musculature of the torso, the inner unit muscles. 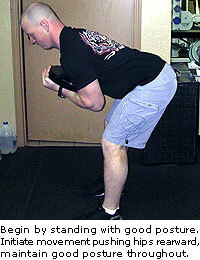 One of the inner unit's main functions is to stiffen the torso in preparation for work, e.g., lifting weights. The easiest way to learn to perform the "Drawing-in Maneuver" is to lie flat on your back, relax and perform diaphragmatic breathing. When done properly, your stomach should rise when you inhale and fall when you exhale. When your stomach falls, you want to hold that contraction. This is the most basic form of the "Drawing-in Maneuver." Always to try to maintain a neutral spinal curvature, which means that you are neither overarching nor rounding your back. Always try to keep your knees in line with the center of your feet. Don't let your knees cave in or bow out. Start with no weight and perfect the movement, then choose a light weight. So there you have it. Four posterior chain exercises for golf-specific strength and stability that will have you well on your way to shooting lower scores! Enjoy. NOTE: Before beginning any exercise or dietary program, consult with your physician to ensure that you are in proper health and that any exercise or dietary program you undertake will not put you at risk. Troy M. Anderson, B.A., PES, CPT, IACPFT, is the owner of Integrated Evolution, LLC, in Tempe, Ariz. The No. 1 goal of Integrated Evolution is to provide individuals with solutions to their performance enhancement needs. For more golf fitness tips, subscribe to The Evolutionary at integratedevolution.org and download your FREE Reports The Eight Keys To Golf Fitness Success and How To Build The Perfect Athlete For Any Sport -GOLF. Troy maybe contacted at integratedevolution@cox.net or called at (480) 227-8090. This is terific article and can be very helpful. However, is there something I can do to gradualy work into the program. 7 months ago I suffered a tear of the quad muscle and tendon from my knee cap. surgery reattached them through anchoring holes in the knee cap. 5 months of therapy has me mobile again, but my golf game is really being affected because I don't have the strength in my right leg to push off. suggestions?